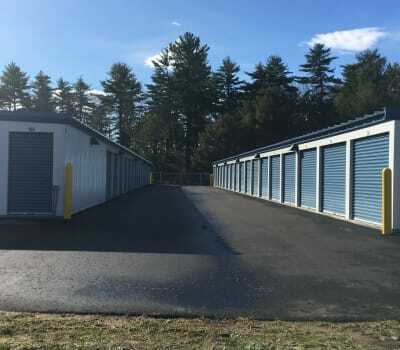 Safe Storage’s well-run self storage facility in East Baldwin, Maine, makes it simple to store your belongings. Our units come in a range of sizes to easily store a variety of items. We have smaller, closet-sized units that are great for household items like boxes and sports gear, while our midsize units can accommodate anything from the contents of a studio apartment to a motorcycle and other gear. Our largest units can store the full contents of a household with up to two bedrooms. Not sure which unit will work best for your needs? Give us a call or come by the facility and let us help you select the perfect unit for your things. Located just across the street from the Postal Service on Pequawket Trail, our East Baldwin facility offers all the convenience you could ask for. Wide driveways, ground-level units, and drive-up access make it quick and easy to get in and out of your unit. And with 24/7 access, you can pick up or drop off your belongings anytime you need. Our modern facility features a gated entry with personalized code access and 24-hour video camera recording, so you can rest easy knowing that your valuables are in good hands. Come see our convenient East Baldwin storage units in person. We look forward to showing you around.